Sometimes it’s the little things that matter most. It’s easy to use, with one-button, one-function design, and features backward-compatible USB-C connectivity for super compatibility. It’s housed in a robust metal chassis, and the included rack ears can be mounted to either face forward or down, letting it stand freely or be integrated into your 19” racks depending on your setup. It also features ADAT in, so you could send your musicians cue mixes using its headphone output. 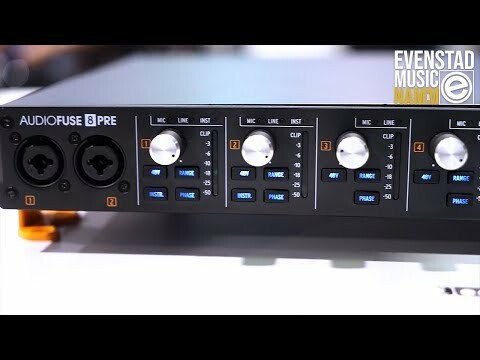 AudioFuse 8Pre comes complete with the AudioFuse Creative Suite, an ever-evolving collection of software effects and instruments that will let you add your own unique signature to your music. Combining favorites from our “You’ll Actually Use” series with Analog Lab Lite, AudioFuse 8Pre lets you also enjoy legendary signal processing effects and iconic synth sounds. Color the pristine inputs of AudioFuse 8Pre with stunning vintage effects!